It’s like Christmas in July! Tickets have been on sale for quite some time for the 2013 Mickey’s Very Merry Christmas Party, and I know some of you out there are already making plans to come celebrate your holiday here in Walt Disney World! If you prefer wide open spaces to walk and shorter lines for attractions, you may be wondering what some of the best dates are to come and party. In researching the best date for the Disney Parks Podcast team to get our holiday on – I stumbled on some great information from TouringPlans.com that I wanted to share with you today. According to the site – last year’s crowds indicate that Tuesday Christmas parties are less crowded on average than parties held on any other day of the week. Friday is the next-best day to attend a Very Merry Christmas Party. We can enjoy lower crowds for the Christmas parties right between the Thanksgiving and Christmas busy periods. Four of the five parties between December 3 and 10, 2013, are among the TouringPlans.com top 7 least-busy parties – but they expect Sunday, December 8th to be a bit busier. While there are no Mickey’s Very Merry Christmas Parties during Thanksgiving week, the parties just prior to and just after that break are traditionally busy. Thursday and Sunday are the busiest days – and many November dates rank among the most crowded. You may also want to avoid the last few parties before Christmas, because they are also quite crowded. In general the wait times during the Christmas parties are quite low, averaging only about 9 minutes. The Christmas parties may be your best bet to enjoy some of your favorite attractions. Touring Plans says to circle Tuesday, December 10, 2013 on your calendar. That Christmas Party, on a Tuesday in early December, was the least-crowded event in 2012’s schedule. If that date doesn’t work for you – just refer to the recommendations above for help. Don’t forget – Epcot and Hollywood Studios have SO much to offer as well during this time of year. I hope you’ll consider coming “home” for Christmas – and we will see soon! Soak up the sounds of a little Limited Time Magic as America Gardens Theatre comes alive at Epcot, thanks to the musical performances of “Mickey’s America Streetbeat.” For a limited time, join Mickey, Minnie, Goofy and Donald as they come together with an energetic troupe of young performers—watch the fun unfold as they take part in an over-the-top display of hip hop, percussion and acrobatics. From the rhythm and tunes to the tap-dancing of their shoes, it’s set to be one incredible jam you won’t want to miss! For tips on how to get great photos with characters – click here! Have you ever seen one of these °o° and wondered how to do it? It’s pretty simple and comes in handy when you are a Disney fan! First you make the ear on the left side. On a PC, press and hold the ALT key – and on the number pad press 1 6 7 and then release all the keys. You should now see the left ear. or a capital O for the head. It’s just a personal preference. I like the lowercase o. 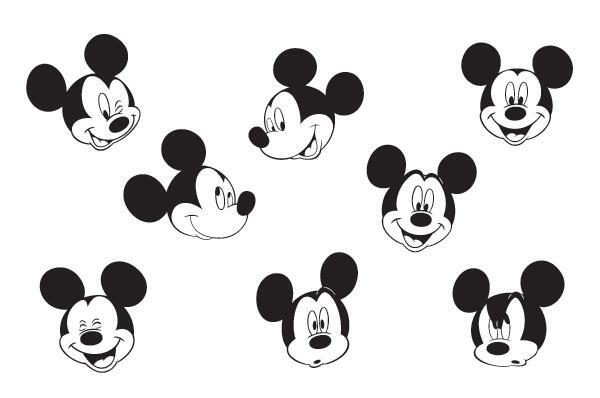 You can make Mickey on an iPhone and iPad too! Press and hold the zero in the number keyboard and the ° will appear as a choice next to it. Keep your finger on the screen and slide it to the left over the degree symbol to type it in. How to Make Your Own Hidden Mickey Cupcakes! Today we are partnering with TemporaryTourist.com for a hidden Mickey Monday blog hop! If you decide to make this recipe I would love to hear all about it! Contact me on facebook or leave a message in the comments section below! We would like to thank Chrisy C. from the Disney Dreamers facebook group for sending us her photo of the cupcakes! We are so thrilled that you were inspired! Don’t they look wonderful?! Way to go Chrisy!! A big thank you to Becca Farrar Robins for sending this photo of her confectionery masterpieces as well! Becca is a Disneyland Mom and the owner of LoveOurDisney.com Thank you Becca for sharing! Throwback: Video and Photo Tour Halloween Around the Globe 2012 – Disney Style! Magic Kingdom Park is home to Mickey’s Not-So-Scary Halloween Party, where Guests are encouraged to dress in their favorite costumes for this ticketed event. The festivities feature two lively performances of Mickey’s “Boo to You” Halloween Parade, which begins with a spooky and spirited ride by the Headless Horseman. Magic Kingdom Park boasts 15 treat locations, two character dance parties, about 60 Disney characters, and a Happy HalloWishes fireworks spectacular with Disney villains trick-or-treating in the night sky. Magic Kingdom gives away more than 215 tons of candy to trick-or-treating guests and nearly 200 individually themed carved pumpkins adorn the balconies and windowsills along Main Street, U.S.A.
New to Mickey’s Halloween Party in 2012, Town Square becomes Villains Square each party night at the Disneyland Resort, with loathsome characters such as Jafar, Ursula, and Captain Hook entering on a ghostly horse-drawn carriage to mingle! On the Rivers of America, the Dapper Dans have been transformed into Cadaver Dans, singing spooky songs as they float along. These guys created a huge buzz on Twitter this year! They were very popular! Also new this year is the Halloween Carnival at Big Thunder Ranch Jamboree in Frontierland, featuring the Magic Cauldron Sideshow. Guests can help cast a magic spell, conjuring a Disney Villain from his or her realm before returning to worlds beyond. YIKES! Celebrating Disneyland Paris’ 20th anniversary in joyfully wicked style, Disney’s Halloween Festival makes a mostly ghostly experience for guests. Pumpkins, ghosts and other spooky spirits welcome guests on the Castle Stage at Sleeping Beauty Castle for “Mickey’s Halloween Treat in the Street!” Mickey Mouse and Minnie Mouse dress up as vampires and Donald Duck is a “little devil” as they and their pals play a series of interactive games with Guests to share in the holiday fun. Disney Villains join the party in Fantasyland, where they mix and mingle with wary Guests at the Castle Courtyard. This video gets cool about 10-20 seconds in – so stay tuned! Disney’s Halloween Party is must-see entertainment at Disneyland Paris, and Terrorific Night is scarier than ever at Walt Disney Studios Park. Disney Dreams! 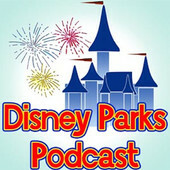 is a nightly show created to mark the 20th anniversary of Disneyland Paris. It features scary moments featuring Dr. Facilier (“The Princess and the Frog”), Ursula (“The Little Mermaid”), and Captain Hook (“Peter Pan”) ! 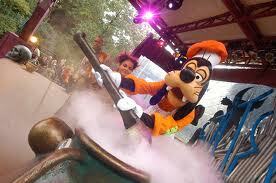 Not to be outdone, Goofy has designed a special machine to make his favorite Halloween treat. This strange candy-making contraption can be found by following the puffs of smoke and sweet smells across Town Square. WOW! This is like a techie’s dream! 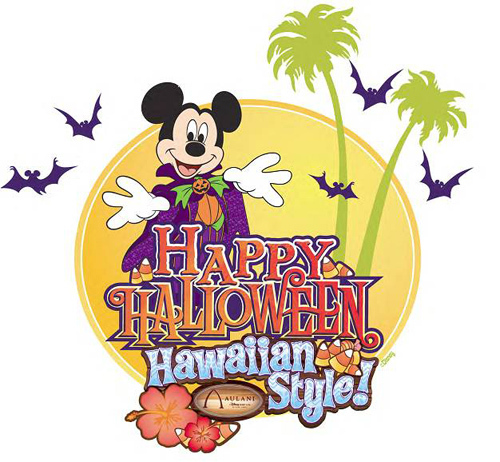 Hong Kong Disneyland celebrates Halloween a little differently! It’s a clash between the Vampire Coven and the Were Tribe in the “Choose the Dark Side Challenge” smartphone game app and augmented reality (AR) experience that attracts gamers and fun-seekers this Halloween season. Guests participate through AR technology by joining vampires in a struggle for power with werewolves. The ultimate showdown takes place at “Main Street, U.S.A. ? Clash of Evil,” where the supreme ruler of the dark forces will be revealed. Haunted Halloween Magic Mirrors can be found around the theme park. The magic in the mirrors is activated by certain T-Shirts! Check it out! “A Halloween Daydream” is on display at Mediterranean Harbor at Tokyo DisneySea. Many favorite Disney characters, including Mickey Mouse and his bony, newfound skeleton friends, are welcomed to join the carnival-like celebration with Guests reveling in the friendly festivities. “Chip ‘n Dale’s Skeleton Fiesta” highlights a lively parade-like atmosphere featuring a live band, vibrant costumes and dancing along in this Dia de los Muertos-inspired celebration in Lost River Delta at Tokyo DisneySea. Bring your Tokyo currency! More than 400 Halloween-themed merchandise items are available at Tokyo Disneyland and Tokyo DisneySea. New merchandise items featuring the Disney characters that appear in “A Halloween Daydream” will be offered at both parks. The Refreshment Station offers a “black” version of the popular Gyoza Sausage Bun, and at Miguel’s El Dorado Cantina, Guests can enjoy skull-motif taco rice. 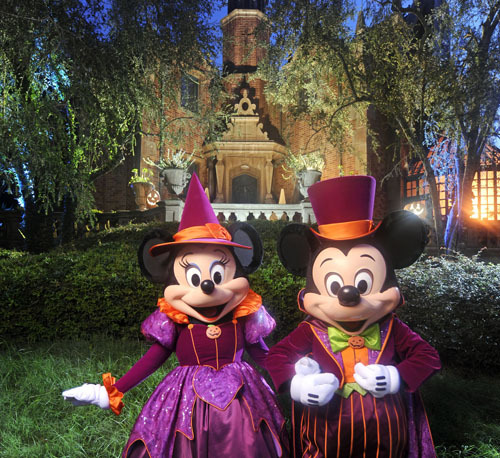 · Haunted Parties: Beloved Disney characters in special Halloween costumes join guests for a fun-filled Halloween costume party complete with live music, dancing and lots of candy. 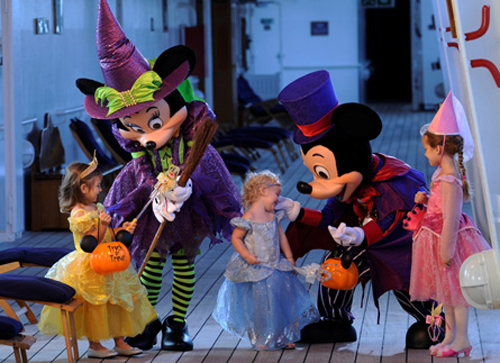 For adults, the nighttime entertainment district on the Disney ships becomes the ghoulish setting for a costume contest and party sure to bring chills to everyone. · Spooky Movies: To get Guests into the spirit of the season, Halloween-themed movies will be shown on Funnel Vision by the family pool and in Guest staterooms. That about does it for Disney Halloweenies this year! I hope you’ve enjoyed Halloween globe trotting with me today! I’ve been called many things but “refined” and “cultured” aren’t adjectives that have been used very often. That’s probably one reason why the Festival of the Masters has not really been on my radar until this year. One of my friends is really excited about this event because she is a person who really appreciates fine art. She is also an AMAZING artist herself! So, of course, I will be heading to check out the Festival this year and I am really excited to share this experience with her (and you!) . Perhaps some of her “culture” will rub off on me! Besides – many activities, as well as parking at Downtown Disney are FREE! That’s a great price if you ask me! “The 37th Festival of the Masters presented by Michaels is a vibrant, open-air fine arts festival in the Downtown Disney area, held November 9-11, 2012. Featuring award-winning artists, this world-renowned show is a highly anticipated annual event for Guests, artists, collectors and art lovers. Whether you’re seeking a colorful day amid Disney magic or a spectacular piece for your personal collection, you’ll discover a variety of delightful experiences at Festival of the Masters presented by Michaels. o Ghirardelli Ice Cream & Chocolate Shop – Kids can make their own Sundae magnet. o LEGO® – Join in the fun as you help a real LEGO Master Builder to construct an 8-ft tall Hulk™ model for the first time! • NEW! Emerging Masters – Get a glimpse of more than 30 up-and-coming artists as they display their unique talents. • Michaels® – Make It Take It – Duct Tape Craft – Who knew duct take could be this fun? Visit the Michaels exhibit near the Waterside Stage to create your very own luggage tag take home craft. • Michaels® Master Mural – It’s your turn to take center stage in the creation of this Disney masterpiece! Join the Michaels team as together we bring to life a masterful work of art…piece by piece! • Irish Artwork at Raglan Road™ Irish Pub and Restaurant – Check out the designs of Graham Knuttle, a renowned Irish painter and sculptor. • Michaels® – Make-it Take-it – Mickey Ear Wood Framing Experience – It’s time to get creative! Design and take home your very own Mickey Ear Wood Frame with a personalized artistic touch. Let your imagination take the wheel with this fun experience designed for families and children of all ages. • House of Blues® Folk Art Festival – See grassroots and funk art at its finest, presented by approximately 35 local and national folk artists. For even more info on the festival click here and here.